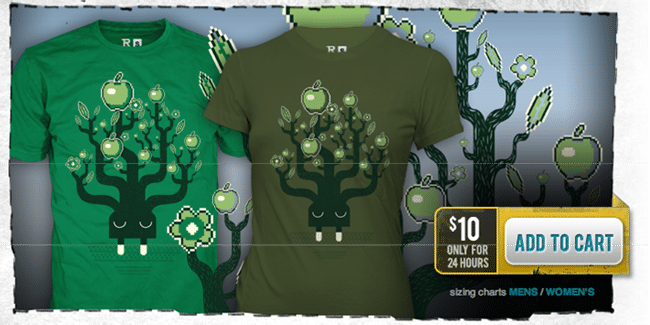 RIPT Apparel is a Chicago-based online retailer of one-of-a-kind designer tees and wearable art. They sell one new design by a new artist every day starting at midnight CST for $10 and it is only available for a period of 24 hours. After that period, the design rests in peace forever in the T-shirt graveyard and a new one takes over its place. 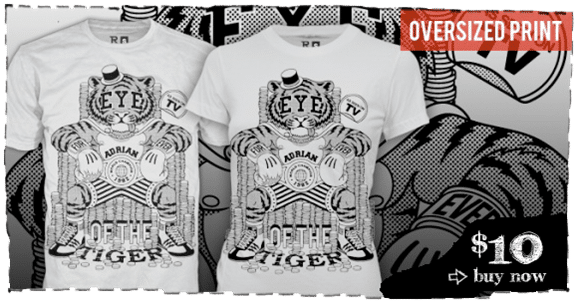 The sense of urgency created by limited availability of the design can be used effectively to drive sales and that is what RIPT Apparel did in their first A/B test. They had never done A/B testing before but were intrigued by the concept and wanted to give it a shot. The tool they selected for this purpose was Visual Website Optimizer. They tested their current buy button against a new buy button to determine which would have the best conversion rate. The conversion rate here being sales of their T-shirts. The following is their control version (or default). Observe that the button isn’t the first thing to catch your attention as it blends well into the overall color scheme. Much to their surprise, they immediately saw a rise in sales. Ideally, they should have A/B tested the new version against the old but this was their first time and as you will read further they did a great job overall. Encouraged by the results, they went ahead and created another variation of the button. This time they decided to emphasize on the tactic that they should have used all along: emphasizing “limited 24-hour availability”. It has been demonstrated again and again that a sense of urgency drives up the conversion rate and this time too it proved to work best. Following version (B) of the button increased their site sales by 6.3% (notice only the button was changed – no new offers, no new products, no new policies). Pause for a moment and think what really happened in this case study. Someone (RIPT Apparel) with no previous experience in the field decides to A/B test, spends time researching what could work better, designs button variations, uses Visual Website Optimizer and sees a 6.3% rise in sales. No gimmicks, no new offers, no change in company strategy. Simply testing of sensible better variations of buy now button. “The sales we have seen since changing and experimenting with our buy button have proven Visual Website Optimizer invaluable. I had some issues setting it up due to our shopping cart system and the team at Visual Website Optimizer walked me through step by step in order to set it up correctly. RIPT Apparel is a great company that successfully proved that A/B testing is not something that only Fortune 500 companies can do. Even small-medium sized online business can optimize and increase their sales by not mistaking A/B testing as a hyped-up fad. A/B testing works and it is addictive; one simply needs to try it at least once. By the way, you should check out RIPT Apparel’s T-shirts – they are really quite cool! Thank you so much to share your knowledge. This is a great recommendation to test different elements of a store front. Thanks for the tips! Great tips. I agree with all of these words. Sucha a great article. It’s really important to do split test in online business. A lot of website owners forget about it.